On his birthday, we’re revisiting a classic from the Luther Vandross arsenal of love songs: his rendition of ‘A House Is Not A Home’. Released to critical and commercial success in 1981, Luther Vandross’s first solo album Never Too Much remains one of the best albums he ever released. The album reached number one on the US Billboard Black Albums chart, and managed a respectful number 19 on Billboard’s Pop Albums chart. More importantly, the album helped put Luther on the path to stardom. The album gave Luther a chance to showcase the incredible depth and beauty of his voice, alongside his abilities as a writer, arranger and producer. Never Too Much combined uptempo feelgood tracks such as the bass-heavy ‘She’s A Super Lady’ (one of the few Luther tracks to feature horns) and the title track, as well as romantic ballads such as ‘Don’t You Know That’, and of course, his classic rendition of the Burt Bacharach-Hal David classic ‘A House Is Not A Home’. Never Too Much had been a long time coming. In fact, Luther had spent the previous decade honing his musical chops. One of his first gigs was as a singer on the children’s television show Sesame Street. He began working as a backing singer and arranger, and would go on to work with the likes of David Bowie, Bette Midler, CHIC and Roberta Flack. He developed his songwriting skills, and was commissioned to write a song for the Broadway musical The Wiz. And he also made a decent living singing radio jingles, becoming the voice of ditties for the likes of 7UP, KFC, and Juicy Fruit gum. While singing about fried chicken or fizzy pop might not be the exciting break most singers dream of, it undoubtedly provided Luther the space to develop his trademark vocal flourishes and gain confidence in his own abilities. For instance, in one session, for a pizza commerical no less, Luther developed one of his signature vocal moves. Asked for something special by the producer, Luther let out what his biographer Craig Seymour has called his “extended bass rumble”, extending the word “sizzling” to si-i-i-i-i-zzling”. Hard to describe, but impressive to hear, this rumble would become his trademark vocal move on record and in concert, becoming a staple in his epic live performances of ‘A House is Not a Home’. Luther was also making a name for himself as a vocalist on the disco scene. He was part of the initial studio incarnation of CHIC, but he also appeared on a plethora of disco albums: he sang lead on a cover of The Supremes’ ‘You Keep Me Hanging On’ by Soiree, ‘Hot Butterfly’ on Gregg Diamond’s Bionic Boogie album (as well as backing vocals), and ‘See You in LA’ and ‘Jet Plane Ride’ for Mascara. These groups weren’t groups per se; they were effectively studio creations by their producers, who brought in the best talent they could find. Whilst those tracks gave Luther the opportunity to showcase his talent, it would be on two tracks by the outfit Change that take his career to the next level. Change was the brainchild of European producers Jacques Fred Petrus and Mauro Malavasi: it was to be a concept group that would exist in the studios of New York only, featuring the best talent the duo could afford. Inspired by CHIC, another disco concept band led by Bernard Edwards and Nile Rodgers, Petrus and Malavasi released Change’s first album The Glow of Love, in 1980. It was an awesome collection of dance music, featuring not only Luther Vandross, but also Jocelyn Brown, who sang the lead vocals on ‘Angel in My Pocket’ and ‘It’s A Girl’s Affair’. The album also featured the classic ‘A Lover’s Holiday’. Yet, and perhaps unsurprisingly with the benefit of hindsight, it was the tracks that Luther sang on which would secure Change’s position in music history. Luther sang lead on the dancefloor classics, ‘Searching’ and ‘The Glow of Love’, two superbly produced tunes that would give his voice the prominence it deserved. His voice on these tracks is still mesmorising all these years later, and for listeners at the time, it would be a taste of what was to come from Luther’s solo career. The record buying public were introduced to the velvet voice, and no doubt left wanting more, wondering who this guy was and when they could have more of him. Interestingly, and an often overlooked part of Luther’s career, is that he had recorded two full length albums prior to his work with Change. He led a self-titled group called Luther, consisting of himself and singers Anthony Hinton, Diane Sumler, Theresa Reed and Christine Wiltshire. The group were signed to Cotillion Records and recorded two albums, the self-titled Luther and This Close to You. The albums largely sank without a trace, and it’s rumoured that Luther was so disappointed with the albums that, once he had the funds, bought the masters from the record company to prevent them being reissued. A savvy bit of business, as no doubt these would have found their way out once Luther started having commerical hits. But, thanks to Luther’s foresight, only limited copies of this record exist (although, naturally, some bootlegs have made there way onto YouTube). Yet, even with his success with Change, Luther couldn’t get a record deal. Instead, he went back on the road with Roberta Flack. Flack was one of Luther’s biggest fans, and encouraged him to try for a solo career. Luther would say that she “lovingly fired” him from her tour. His confidence increased, and he would use money from his day job singing jingles to create his own record, and shop it around the various record labels. Finally, Epic Records signed Luther up and in 1981 the label released Never Too Much. Few debut albums are as stunning as Never Too Much. The album was unlike anything else on the market at that time: big bands ruled male R&B, with the likes of The Commodores and Kool & The Gang finding commerical success, and those solo male artists who were successful tended to be big, throaty shouters, like Teddy Pendergrass or Barry White. In this soundscape, Luther sounded new and exciting, carving out a sophisticated soul niche for himself. As all Luther-ologists know, the final song on Never Too Much is, of course, ‘A House Is Not A Home’. Written by iconic songwriting duo Burt Bacharah and Hal David, the song was originally a hit for sixties superstar Dionne Warwick. Dionne’s version of the song was a hit for her, and it was subsquently recorded by various other artists, including Brook Benton, whose own version Burt Bacharach also produced. Growing up in New York in the sixties, Luther spent his formative years worshiping the singers of the day, in particular female singers such as Patti LaBelle, Diana Ross and, most of all, Dionne Warwick (male singers, other than The Temptations and Smokey Robinson, rarely interested Luther). So it’s not suprisingly that he would cover her music (he would go on to cover ‘Anyone Who Had A Heart’ and ‘Are You There (With Another Guy)’. Yet, while the young Luther may have grown up listening to the Dionne Warwick version of the song (or maybe even the Brook Benton version), his version owes more to gospel legend Mavis Staples than Warwick. 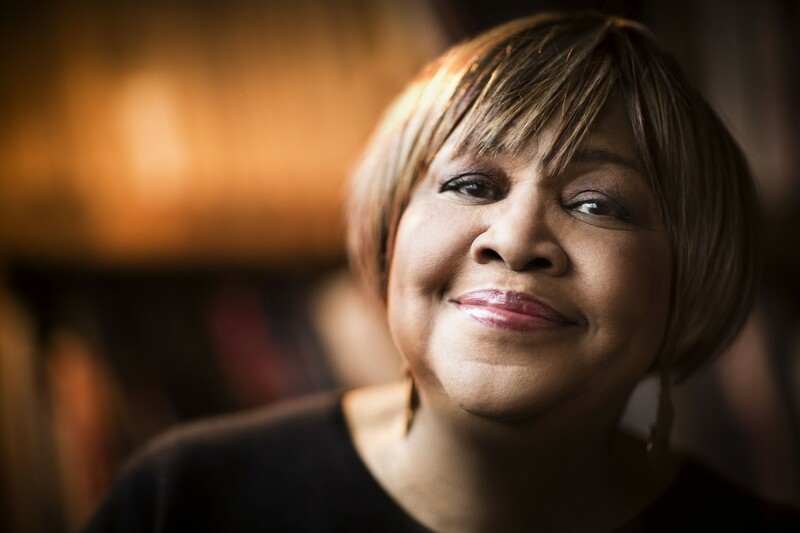 Staples, one of America’s finest singers, sang with her group The Staple Singers, made up of her father Robuck “Pops” Staples, and siblings Yvonne, Cleotha and Pervis. The group gained a reputation for their incredible gospel harmony and for the folksy blues of Pops guitar, usually the only instrument that would accompany the group’s singing. It was Mavis however who had the best voice: she was the group’s lead singer, juxtaposing her short frame with her big, deep, gospel voice. After conquering the gospel world, the group entered the R&B and soul worlds in the late sixties when they signed with Stax Records. At Stax the group were given a soul makeover. The group’s gospel harmonies remained intact, but the gospel and blues of their earlier recordings gave way to the Memphis soul sound, complete with a pounding rhythm section and brassy horn arrangements. The group’s popularity increased thanks to hits such as ‘Respect Yourself’, ‘If You’re Ready (Come Go With Me)’ and, the soul classic, ‘I’ll Take You There’. While at Stax the group were introduced to all the labels stars and musicians, including Steve Cropper, guitarist with Booker T & The M.Gs and a songwriter-producer in his own right. Cropper, who had co-written and produced Otis Redding’s ‘Sitting On The Dock of the Bay’ among others, was given the chance to record a solo album with Mavis. The solo Mavis Staples album wasn’t as successful as perhaps it should have been. Yet, her version of ‘A House is not a Home’ was clearly heard by a young man from the Bronx. Unlike the more traditional arrangements of the song, Cropper and Staples recorded a much slower version of the song. Cropper elongates the song, allowing Staples to weave in and out of the lyrics, ad-libbing, scatting and giving a much more soulful rendition than the earlier, pretty straightforward versions done by Warwick and Benton. If you listen to the Mavis version and then the Luther version, it’s fairly clear where Luther got his inspiration from. The fact that Mavis’s version only made the charts in some cities in the US allowed Luther’s version to be portrayed as a new way of doing the song. The Mavis Staples version was only a hit in some regional markets in the United States, and was only played on radio because DJs liked what they heard. Stax, more focussed on selling Isaac Haye’s Hot Buttered Soul album, didn’t push the track or the album. As a result, the Mavis Staples version has mostly gone unrecognised. This lack of recognition is, in part, due to the success of the Luther Vandross version. His version became a staple of late night R&B programmes on black radio, ushering in the dominance of the ‘Adult Contemporary’ genre of broadcasting and recording. The song would become one of Luther’s signature songs in concert, where he would expand the song even further, performing 10 to 15 minute versions of the song, using every vocal flourish in his arsenal. Even the song’s writer, Burt Bacharach, would write in his autobiography that Luther’s version was the best he’d heard. One particular live rendition of the song has gone down as one of Luther’s finest moments, when he performed the song at the 1988 NAACP Image Awards, in front of Dionne Warwick no less. The version stayed mostly true to the recording on Never Too Much, but Luther couldn’t resist to ad-lib here and there, as well as using his “bass rumble”. My favourite part is where he adds in “Good morning/Good evening/Hello/Bye-bye, baby” at roughly a minute into the performance, sending the crowd into a frenzy. It’s arguably Luther’s greatest performance, made even more emotional by Dionne Warwick who was in tears as she watched Luther reimagine her song. Personally, I think you can assess the quality of an artist by how well the’re able to reimagine songs. Covers are a major part of the music industry, but it’s only the most imaginative and creative arrangements that are likely to be listened to years in the future. How many people will choose to listen to Barry Manilow’s covers rather than the original songs? Not everyone can reimagine classic songs and make them their own. But the best artists usually can. Take Aretha Franklin. Most people don’t realise that ‘Respect’ is actually a cover of a minor hit for Otis Redding. Al Green’s version of The Temptations’ ‘I Can’t Get Next To You’ is a piece of pure Memphis funk, a change from the psychedelic-pop of the Motown original. Isaac Haye’s covers of ‘Walk on By’ and ‘By The Time I Get To Phoenix’ were completely different from the pop originals of Dionne Warwick and Glen Campbell. And that is the point of this. Luther does not merely cover Dionne Warwick. Or for that matter, does he merely cover Mavis Staples, although he was clearly influenced by her version. Instead, Luther reimagines the song in his own unique way, creating a intepretation that has since become the definitive version. Today, when someone covers ‘A House Is Not A Home’ they cover the Luther version, not the Dionne version. Today, Luther would have been approaching 70 yeard old. It’s a testament to his incredible voice and, equally, skills as an arranger and producer, that we’re still mesmorised by his rendition of ‘A House Is Not A Home’ nearly four decades later. The song will live on, and no doubtedly be covered hundreds of times more in the future. But it’s the Luther Vandross version that we’ll continue to love the most.